Brasserie Dupont was an early favorite of mine and made famous through their Saison Dupont in the US. 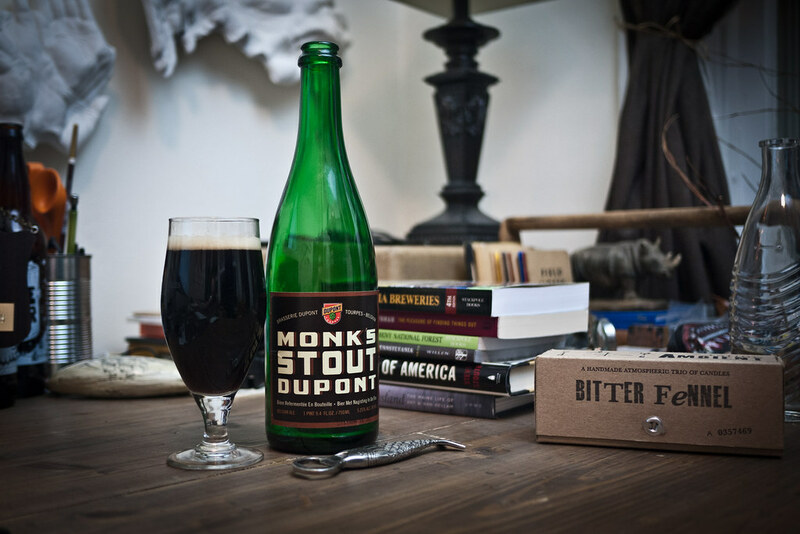 For 2011 they’ve revived a recipe from the 50s to give us their take on a “Belgian Stout” using some of the same characteristics of the Saison style to dry up a typically creamy, sweet recipe. Dark, dry, some mild herbal qualities — this Monk’s Stout is a bit outside the style as intended. A nice roast, but not heavy — only mild coffee and chocolate notes here, not too bitter. Almost a hint of lactose hiding under the cereal quality and a little nutty on the finish. The head, as you can see, is a bit fluffier than a stout typically is, giving it the appearance and open aroma of a Saison at first — a bit of straw and hops. Overall, an interesting variation that seems to deliver on intentions and brightens rather than subdues the occasion with its effervescence. And I love the heavy-handed design of the label with its sign-painter-esque lettering.